Jeff Birmingham has been a member of Houston Safari Club since 2008. In 2015 he was presented the President’s Award for service to HSC and is currently serving as Chairman for the 2016 Sporting Clays Tournament. Jeff and his wife Sheila have 2 children, Hunter 25, and Taylor 23 which both enjoy hunting and shotgunning sports. Immediately after graduating from Texas A&M University Jeff began his career in the printing industry; his most recent service to the industry includes serving as President of the Printing Industry of the Gulf Coast from 2013- 2015. During his 31 years in Houston Jeff has been active in numerous community events from accepting a leadership roll in a church plant, to serving on the advisory board for Child Advocates, as well as serving on the shoot committee for Operation Game Thief an organization that provides support to Texas State Police (game wardens). 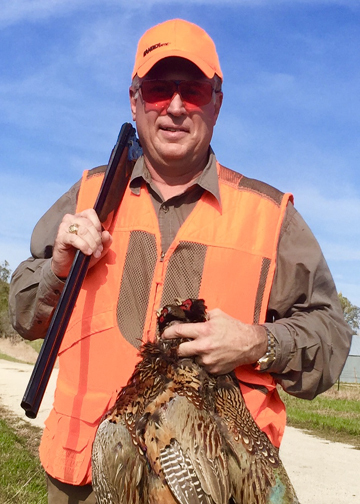 Jeff has been an avid hunter and competitive shooter since childhood and enjoys serving the membership of HSC.